I have been really lazy about taking pictures of what I'm sewing, but pretty disciplined about playing with other people's old pictures. So here is my tribute to the lovely Saint Ann. 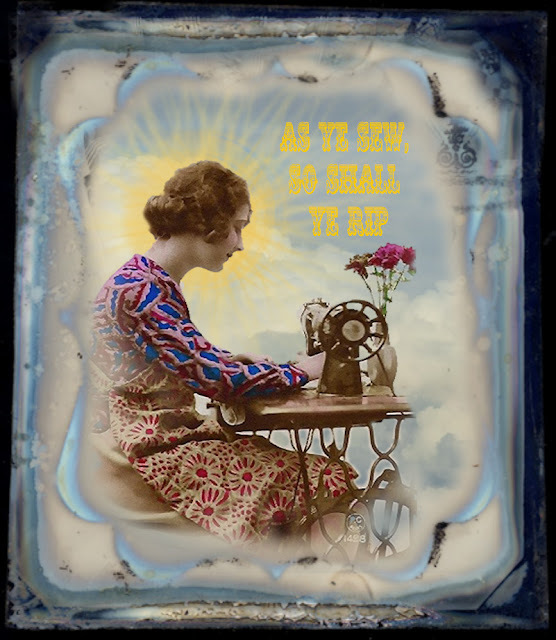 Patron saint of housewives, and seamstress alike. She was Mary's mama, don't ya know? I also feel compelled to point out she also was originally said to have had a virgin birth. Was that a lot more common way back when? Or maybe it just ran in the family. Anyway the Catholic Church had the story straightened out a few centuries back, so I should just stop spreading rumors. Anyhooo, as my threads break and my seams tweak, it just find it comforting to know that there is a specific saint I should be calling on. Her feast day is July 26th. Maybe I should throw her a party! I guess "St. Ann pray for me" is nicer than what I usually say when I'm sewing. I'm going to keep that in mind next time. yes, you should throw a party! Yes, throw a party, and consider making cards to sell of some of these fabulous photoshop things you have been doing! My first impression is that only a renegade Catholic could make a joke like that and get a chuckle from someone like me. But...maybe people other than renegade Catholics laugh at the idea. I can't say for I am one of those black Catholics who can laugh too hard at the Blues Brothers. I do enjoy your posts. I guess I wish I was a renegade Catholic. It's a pretty rich heritage. I mean it no disrespect. I look at it like a kid with their nose pressed up against the window. And the Saints? They positively spark my imagination. The imagery is so haunting, and there's this practical side to them too.